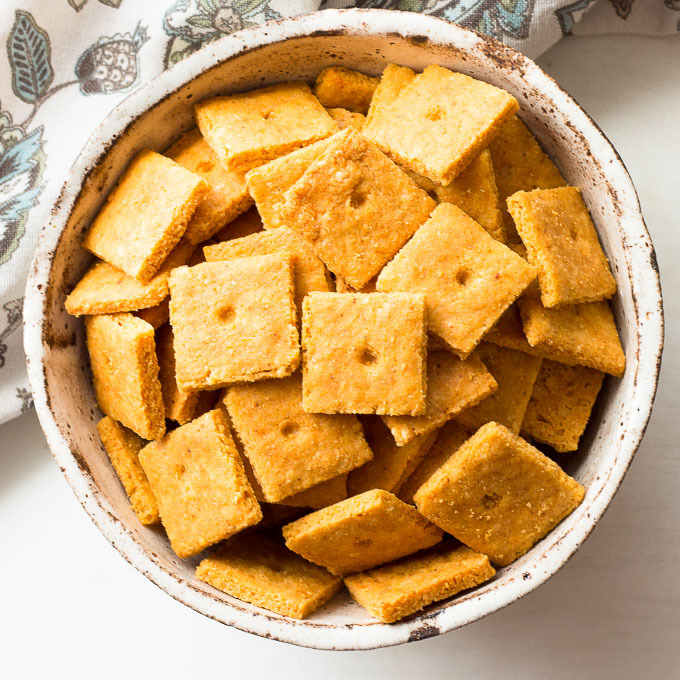 These low carb cheddar cheese crackers have a flaky, crispy texture like no other. If you miss the authentic crunch of store bought crackers, these are for you. And, they’re 2 net carbs per 10 crackers! Keto heaven. With school back in session, I’m always looking for new snacks for my kids; either to put in their lunch boxes or to give to them when they come home. Their little brains are working so hard learning everything we did at that age and more! By the time they get home they need a little snack to help nourish their bodies and re-fuel those brains. When I was a kid, goldfish crackers were a popular snack cracker. We always had a package in the house. And like every other kid our age, my brother and I thought the cheddar cheese goldfish were the best! My mom, however, much preferred the Parmesan variety and kept that bag for herself I remember sitting on the couch with my bowl of crackers, watching cartoons until it was time for homework. When we were out of goldfish, we resorted to eating oyster or soup crackers or celery with cheese. We didn’t care, all we wanted was an easy, crunchy snack. Nowadays, my own kids prefer a crispy cracker to almost anything else as their school time or healthy after school snack. Sometimes, I purchase snacks for them from the store, but gluten-free crackers are expensive and grain-free crackers are almost non-existent! Anyway, I’d rather get in my kitchen and make crackers from scratch at home (like these crispy almond sesame crackers). They take no time to put together and the only “fussy” part is the rolling. I’m an old pro now, and it takes me less than 10 minutes to roll and cut the dough. A pizza cutter makes quick work of it. By the time the oven is ready, so am I. 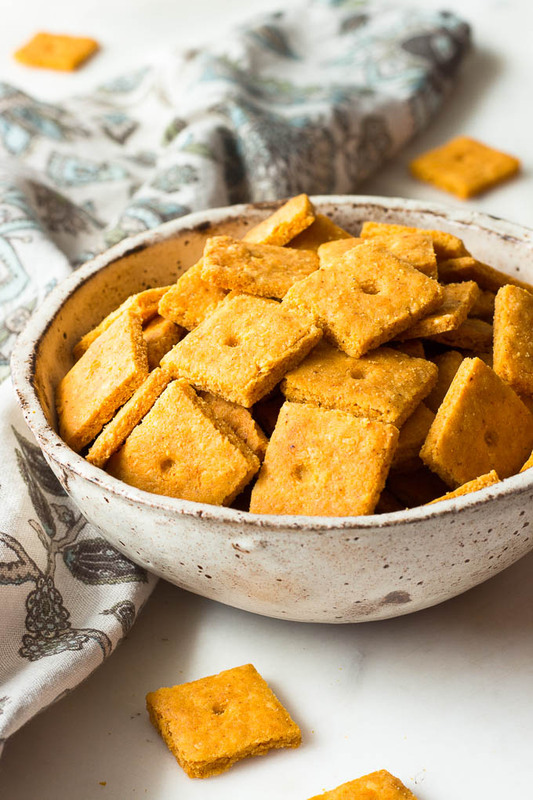 This recipe for low carb cheddar cheese crackers has an ingredient that produces a texture unlike any other low carb cracker – crispy and flaky just like the real thing. Nutritional yeast, affectionately called “nooch”, is full of b vitamins and has a wonderful “cheesy” or umami flavor. It was the secret ingredient in many vegetarian dishes I used to make back in the day. If you are are trying to avoid yeast, you can feel assured knowing that this product is rendered inactive by heat processing. It’s rich cheesy flavor compliments the cheddar nicely. Every time I make these cheddar cheese crackers my kids beg for more. At 2 net carbs per 10 crackers I don’t mind mind obliging! [NOTE] If you are looking for a low carb Parmesan cheese goldfish copycat, take a look at this guest post I did for All Day I Dream About Food. The process photos above are of the Parmesan crackers but it’s the same for the cheddar cheese crackers as the recipes are very similar – try the “chive variation”! So. Good. 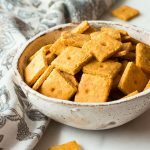 These Low Carb Cheddar Cheese Crackers are 2 net carbs per 10 crackers! These low carb cheddar cheese crackers have a flaky, crispy texture like no other. If you miss the authentic crunch of store bought crackers, these are for you. And, they're 2 net carbs per 10 crackers! Keto heaven. Preheat oven to 350 and place the rack into the middle position. Cut a piece of parchment paper to fit the dimensions of your sheet pan. My pan is 18 by 13 inches (or 46 by 33 cm). Grate the cheese. Measure the dry ingredients (the first 9 ingredients) into a medium bowl, stirring thoroughly with a whisk to break up any lumps. In a smaller bowl, whisk the eggs and olive with a fork. Add the egg mixture to the bowl with the dry ingredients. With a rubber spatula, work the ingredients together to form a ball of dough. Place the parchment on the counter and the ball of dough on top. Flatten the dough slightly with your hands. Cut a piece of waxed paper longer than the parchment and spray one side with baking spray. Place it oil-side-down onto the dough and begin rolling out the crackers. I roll a few times, then lift and reposition the waxed paper. Cut any dough that goes beyond the parchment and patch it to areas that need more. Continue until the dough is even in thickness and just about to the edges of all sides of the parchment. With a sharp knife or a pizza cutter, cut a neat edge around the perimeter of the dough, discarding the extra bits. Then, proceed to cut the dough into 1 inch columns and rows, yielding 90 -100 1 inch x 1 inch squares. I like to cut the short side first, leaving the long side for last - and I use a ruler. This whole rolling and cutting process should take about 8 minutes. Bake for 15-18 minutes. Remove and let cool for 5 minutes. Carefully break up the crackers, spread them evenly in the pan, and place them back into the warm oven for 10 minutes to complete baking. Cool completely before enjoying. Store in an airtight container on the counter or in the refrigerator if you prefer. Makes 90-100 crackers. For a Parmesan cheese version, check the post for the link to recipe at All Day I Dream About Food. Just spent the last 20min trying to find “low carb maiden cheese crackers” on Google ha ha. I’ve been making this recipe for a really long time, thank you for creating it! It’s our favorite. Just made these yummy crackers! I substituted regular (plain) nutritional yeast for Pop Zest’s Artisan cheese nutritional yeast flavor! Sooooo good!! Do you use the large flake nutritional yeast? Also, for the seasonings, is powder okay to use or do i need to buy granulated? This recipe looks amazing, cant wait to try it and curb my crunchy craving haha. Thank you Kim. I am still in the learning process when it comes to cooking these types of low carb foods. I appreciate it! The crackers are amazing but i put them in a baggie now they’re soft? This looks great and I’m going to try them. Question for clarification – when you put the crackers “into the warm oven” for the second bake, is the oven still on, or turned off and just using the residual heat? Also, what would you think of a sprinkle of additional salt on top before baking? Either extra, or cutting back a bit on what is in the recipe to balance. I loooooove that salty crunch! I’m planning to take these to a crossfit comp this weekend to replenish electrolytes! Hey thanks for the fast response! I did my inital bake at 350 for 15 minutes, then I did my second bake for the same, and I think they came out pretty well! I was not at all careful when cutting them – I am baking with a toddler handicap – and I think if I had been a little more uniform they would have re-baked a bit more evenly. But I am not complaining! I reduced the salt in the dough a bit, then after I had rolled it out, I dusted it with a fine koher salt and gave it one more gentle roll to fix the salt on there. I definitely get that good salty experience when I eat one! Some people were asking about using a food processor – I used one and I think it was a very efficient method. I put in the grater to do the cheese, then just switched to the blade and put in all the dry ingredients. I buzzed them to combine, then in went the eggs/oil and it pulled together easily. Since this is my first time making them I can’t compare to the manual way, but I can tell you it was easy and yummy. These crackers passed the toddler test – he’s already been back asking for “mo” – and I’m looking forward to having them for crossfit fuel tomorrow. Definitely on the make-again list! Just made these, followed recipe as is and OH MY GOSH are they amazing! Thank you! Best cracker recipe I’ve tried! Easy too!! !st parafraph states 2 net carbs per 10 crackers. 6th paragraph states 3 net carbs per 10 crackers, Then, back to 2 again in the bolded statement just above the recipe. Just wondering which is correct, not so much for me but for a Keto friend I’m making this for. Thanks! They look great BTW. I’ll re-post after trying them. What did you use to punch center holes? Seems like it would be very tedious. Do you think brewers yeast would have the same effect? Can you use store bought sharp shredded cheese? Delicious! I had to stop myself eating all of them fresh out of the oven. The flavourings are amazing. I used 1/4 cup Parmesan and 1 cup tasty (cheddar) cheese. I’d make these even if I wasn’t doing low carb. I love crackers! Especially these! My kids would LOVE them! These look YUMMY! I don’t have the yeast. Is it just for nutritional value? Can I make these with success without the yeast? Crackers are the thing I miss most! I would so love to know if this recipe works with coconut flour? Fiance is has a severe nut allergy so I prefer to avoid making anything with disguised nuts that he may inadvertently eat. I have visions of him eating an entire tin of these on a walk through the kitchen! I just tried a part coconut flour part almond flour cheeze it cracker & it was really gross. I altered minimalist baker cheez-it recipe which I love!!!! to try to make it Keto friendly & I don’t recomment coconut flour cheez-its. However, this recipe is vastly different in that it uses real cheeze. Perhaps that would mask the coconut taste better? Try a quarter batch so not to waste the expensive ingredients. Good luck! I made these recently and they are THE best cracker recipe I’ve made so far! I didn’t have cheddar so I used the Colby/Jack mix in its place. Kudos!!!!! Hi, they look awesome! Can I use just cheddar cheese instead of parmesan and omit the yeast ( since I don’t have it) like another person in the comments left it out and they were still good. One more thing, how long will they last and do the stay crunchy if refrigerated? Tk you so much. Hi, Sharon. I worked on this recipe for a while to get the taste and texture just right. You can make any subs you wish, but I don’t guarantee the same results. As the post explains, the yeast is what made the crackers flaky. Without the yeast they still taste good, but the taste is a little different and texture is that of a regular low carb cracker. I just wanted you to know so you weren’t disappointed if they didn’t look like the picture. The nutritional yeast is what gives them their incredible cheesy flavor! Yes! And the flaky texture, too. It’s awesome! I’m so excited to make these – they look delish! I don’t have any almond flour on hand. Do you think it will still work with coconut flour? If so, are there any substitutions I should make to reconcile the dryness of the flour? Thanks for your feedback. I agree – not going to risk it. I’ll wait til the next shopping trip and make them according to your proven specs. Thank you! I made these today. So good! I replaced half of the almond flour with flaxseed meal because I didn’t have enough almond flour. I mixed the dry ingredients in my cuisinart, then added the eggs and oil. I used MCT oil btw. They turned out pretty good! Thank you for the recipe! I can’t wait to try these. Coild we leave out the seasonings except for the salt? Also can this dough fit into a cookie press to make cheese straws? Thank you. Hey Kim! I made these crackers today and they are fabulous! I could not stop eating them! My kids loved them and my daughter said OMG mon you got cheese its? Ha ha she didnt even know the difference! I can not believe how crunchy they yet flaky too! So glad I made these! I love these crackers! I have made them numerous times and they always turn out great. My variation is to use Monterey Jack cheese (because it is so bland) and butter flavoring to achieve a substitute for Club Crackers. I also bake them on a Silpat and you are correct that they take longer to bake. I can’t turn the oven off for the second baking or they never crisp up. Love your recipes Kim. Thank you! Could I use 3 egg whites, don’t like eggs. Will flaxseed flour work for these? I’m allergic to tree nuts and coconut :(. Can I cut them smaller to “get more”? Kim, you are a genius. I have made these crackers a couple of times and they are the closest I have ever found to wheat crackers. Flaky, crisp, very tasty. How did you ever come up with using nutritional yeast to make them flaky? Brilliant. Should I use shredded cheese? My dough looks lumpy and not smooth from the cheese. Question: How do you prepare the cheese? Is it finely grated or what? Thanks so much. I’m so excited to try these! I just made these crackers and they turned out amazing! Thanks for the recipe! So glad you were happy with the recipe, Angie. Have a super weekend. I can’t wait to make these, but alas! Must wait until Amazon delivers Bob’s Nutritional yeast, Friday – the brand I bought locally has twice as many carbs, tsk, tsk. I have some low carb friends, and these will make adorable Christmas presents! I love baking on Silpats, and will let you know the results. I always wash mine well with hot soapy water, and suspect their perennial slightly “greasey” feel is inherent to their engineered releasing qualities. I’ve made these twice now and I love them! Super crispy if you leave them in the warm oven for a little longer! These are a very flavourful cracker good to eat on it’s own. The flavour is a bit too overpowering when using it as a vehicle for cheese or dips. The second time I made them I used mozzarella and no paprika, this made a more subtle flavoured cracker which was nice. • The first time I made them too thick and they weren’t as nice. Roll out as thin as you can. • It’s hard to break them apart after baking. Carefully place the parchment with the baked crackers on a cutting board to cut along the lines to break them apart. • leave them in the slightly warm oven for longer than it says here to really dry them out for a crispy cracker. They will last longer if they are crisp all the way through. This is excellent advice. I realized all of these things after making them once but I highly recommend any readers to follow the recommendation listed as you will have a perfect cracker each time! Looking forward to having this crunch! Oh my! I rarely comment on recipes, but this is one recipe that is definitely worthy of 10 stars! Best crackers ever, and so flaky! The only change up that I did was add a teaspoon of celery seed (because we like the flavor), and upped the salt a little since I did not use celery salt. I also burnt my 1st batch, but got much better at making them since then. After the initial bake, and after separating them, I turn my oven down to 200 and just keep checking them until done since some seem to take a little longer than others to reach that crunchy cracker stage. What else could I use in place of nutritional yeast? 2 questions: are granulated onion and granulated garlic onion/garlic salt? Or onion/garlic powder? And have you ever tried these using a silpat instead of parchment ? I can’t wait to make these! Hi Kim – I only have one question. At the end you say to put back in warm oven for 10 minutes. I’m thinking that must mean I turn oven off after initial baking, and after the 5 minute cool, and breaking crackers, they go back in oven that is still warm from initial baking, for 10 more minutes? Just wanted to clarify. Thanks so much for all your hard work developing recipes! Wow! 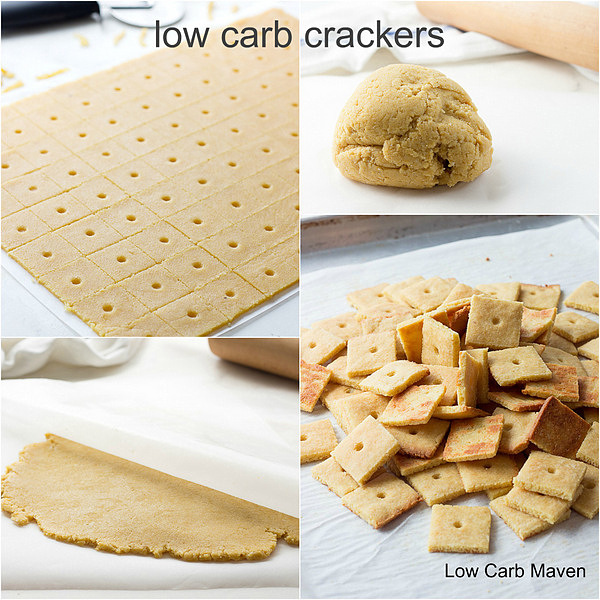 Crackers made with almond flour, I don’t think I have ever seen a similar recipe. They look amazing, I think I will try them. I made these today and they are fantastic. I don’t usually have much luck cooking recipes from online food blogs, but so far every single recipe I’ve made from your website is a hit! Is there a way to go back and see your older recipes without sifting through the index by category? I don’t see a button to go back to older posts? Thanks! Is there any way to make it eggless? I love cheesy crackers! With the addition of garlic, onion and nutritional yeast they sound super tasty. Will definitely have to try them. These look delicious. The little hole in the middle question. How? Without it, does it affect the baking time? Thanks. These look so good! My son and husband often munch Goldfish as a snack – I’d love to have something like this so I can snack too! Thanks Kim! I’m from South Africa and unfortunately there are quite a lot of low carb stuff that we don’t get here. I will for sure try the recipe and let you know how it works out! i made the crackers also and they are very tasty. You can buy the yeast on Amazon if your having a hard time finding it like I was.